Hot Rod Sled Shop PDRIVE 850 ETEC Adjustable pivot bolt kit. Our kit has 3 versions with 30mm bolts adjustable form 14.8-19 grams, 35mm bolts adjustable from 16.4-20.6 grams, and 38mm bolts adjustable from 17.2-21.4 grams. 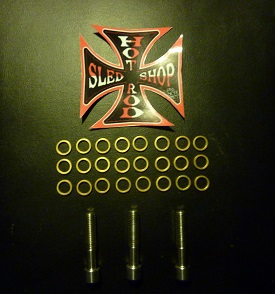 These bolts are 304 stainless steel with 11mm head and include 24 brass washers that are .5 grams each. These kits will allow more precise tuning for both high and low altitude applications of the PDrive clutch. All kits include 3 bolts, 24 brass washers, and instruction sheet.